Why was MacGyver's first name kept a mystery? An early press release revealed MacGyver's first name to be Stacey, but when the show aired it was never uttered. Not until the last season episode "Good Knight MacGyver" do we finally learn that MacGyver's first name is actually Angus. Why did the creator/producers choose to make a mystery out of MacGyver's first name? The name 'Stacey' was never formally adopted within the show as canon: instead, they went for him just being called 'Mac'. The intention, in the first season, was for the character to have a somewhat mysterious background, with hints of history rather than specifics. This approach was dropped by the end of the first season, partly because it wasn't very successful, partly because it didn't catch the interest of the audience. Instead, the character was given an increasing amount of backstory (not always consistent). By the fifth season, the absence of a first name had almost become a running joke; a near-reveal (done partly as an audience tease) established that MacGyver disliked his first name, never used it, did not allow its use and would not answer to it. The full reveal was finally done in the final season, and a big production (a two-part episode with fantasy sequences) was made of it. 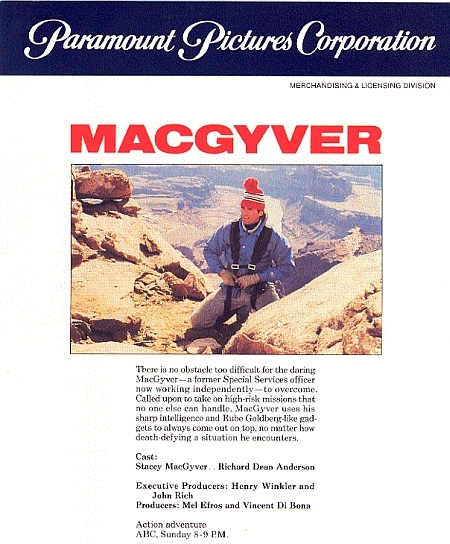 Other than that episode, the only time the name was ever mentioned was in the series finale: it was revealed that MacGyver's son had been given the name 'Angus' as a middle name, and that he didn't like the name either. I think it had to do with the name Angus itself. When you think of that name, you come up with either images of a Scottish person, or just Angus beef (okay, maybe it's just me, but still). I think it's plausible Mac was teased for a long time in school about his name, and just decided to go with MacGyver or Mac for short. Mac sounds 'cooler' than Angus and doesn't illicit the same type of teasing (or questioning) that the name Angus would provide. I think it was to create a connection with the title and the character, you wouldn't want to name your tv show 'Angus'. But you want your audience to remember the show and the character, so you have everyone call him 'Mac'. Plus, as the others said, it adds an air of mystic to the show. His first name was Stacey. They kept it a secret to add a sort of mysterious aspect to him. Not the answer you're looking for? Browse other questions tagged macgyver . Why was the episode “The Mountain of Youth” almost lost?